Here we are! Let’s build it! Here some easy steps (image below, don’t panic). 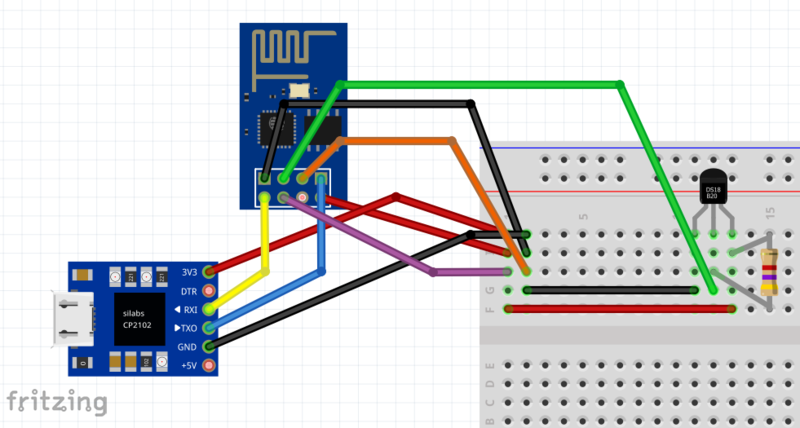 With some jumper wires you will connect the 3V3 and the GND pins of the ESP8266-01 to the breadboard. Put the DS18B20 on the board with the flat side facing you. With another wire connect the left-side pin to where you connected GND pin. Put the 4.7k resistor so that it connects the central and the right-side pins. With a wire connect the right-side pin to where you connecte the 3V3 pin. Connect the central pin to the IO2 pin on the ESP8266-01. No we need to connect the USB-TTL serial converter (keep in mind that the names can change slightly depending on which one you have, but they should be easily recognizable). Connect the 3V on the converter to where you connected the 3V3. NOTE If you also have a 5V connector be careful. Only use the 3V! Or you may end with a fried ESP8266-01. Connect the GND on the converter to where you connected the GND. Connect the TX on the converter to the RX on the ESP. Connect the RX on the converter to the TX on the ESP. Now, with this setting we can, when plugged, the USB-serial converter supplies the ESP8266-01 with the energy it needs and you will be able to communicate with it. However, for the initial setup we need to put the ESP8266-01 in what is called flash mode, in which we can flash (i.e. copy) a different firmware on it. To do this we just need two more connections. Connect the EN pin of the ESP8266-01 to the 3V on the breadboard. 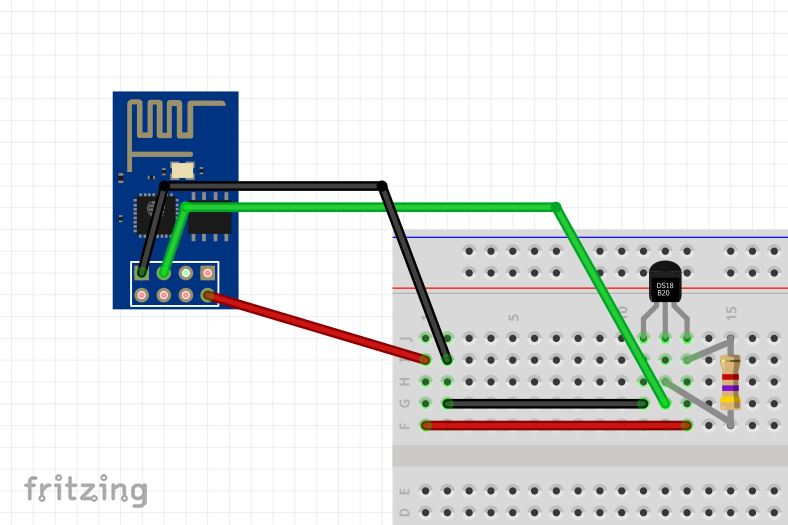 Connect the IO0 pin of the ESP8266-01 to the GND on the breadboard. Now the only pin of the ESP8266-01 not connected is RST. Everything should look like this. 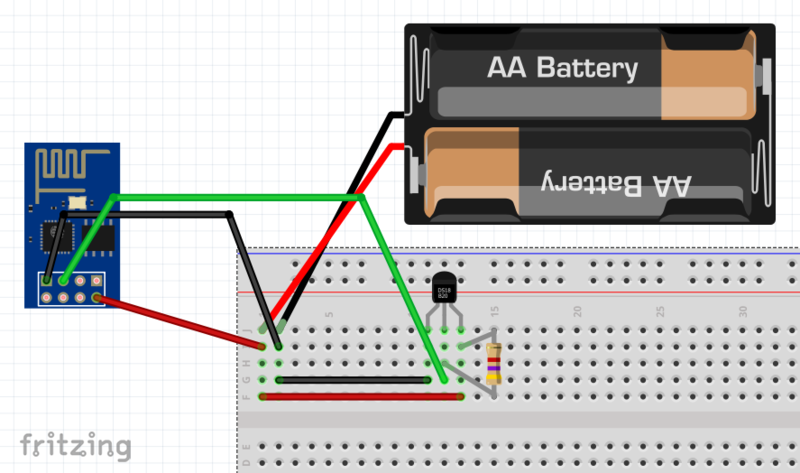 By the way, this is how you may want to connect the batteries when everything is done.